NFL LEGEND and PROFESSIONAL FOOTBALL HALL OF FAMER MICHAEL IRVIN TO HOST THE 5TH ANNUAL EVENT. 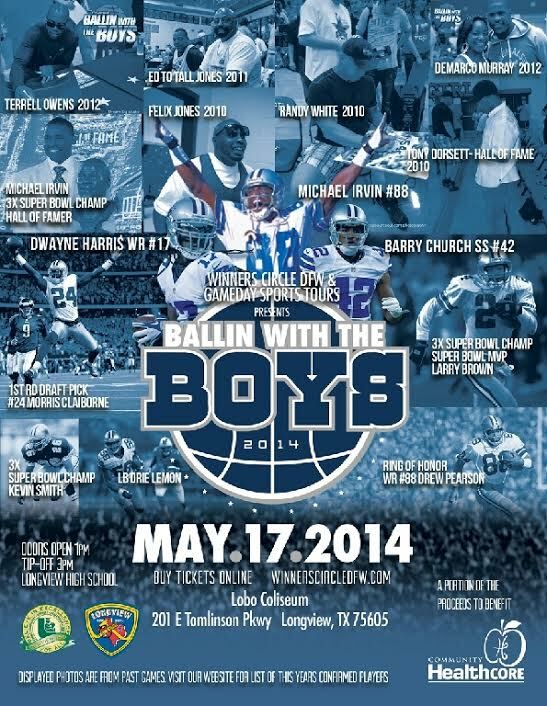 Longview, Texas – Current and former Dallas Cowboys stars are set to play in the 5th Annual Ballin With The Boys charity basketball game against the Longview Fire Department. The game will take place at Lobo Coliseum on Saturday, May 17th, 2014 and will benefit the Community Healthcore. East Texas is gearing up for one of the most anticipated events of the year hosted by NFL Legend, Michael Irvin. Irvin, also dubbed as “The PlayMaker”, was selected by the Dallas Cowboys in the first round, eleventh pick of the 1988 NFL Draft. Irvin ended his career in 1999 with the Cowboys as a three-time Super Bowl Champion, setting both franchise and NFL records. In 2007 Irvin was inducted into the Professional Football Hall of Fame. This years’ celebrity host is guaranteed to draw a crowd when some of the biggest names in sports hang their cleats for a great cause. Fans and sports enthusiasts will have the opportunity to enjoy a competitive basketball game, experience the halftime slam dunk contest, and will be able to participate in a private celebrity autograph signing prior to the game. The 2014 confirmed celebrity contenders thus far are Dallas Cowboys Morris Claiborne, Dwayne Harris, and Barry Church; former Dallas Cowboys stars Larry Brown, Kevin Smith and host Michael Irvin. Location: Lobo Coliseum, 201 E. Tomlinson Pkwy. Longview, TX. Time: Doors open at 1PM, Game Tip Off at 3PM. This event will benefit Community Health Core: helping people and their families heal the consequences of mental illness. Providing programs and services in greater East Texas that help people lead lives free from addiction.